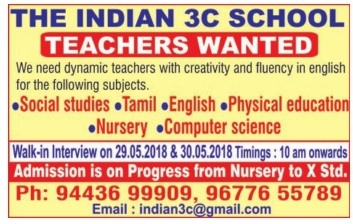 The Indian 3C School, Madurai has advertised in THE DINAMALAR newspaper for the recruitment of Teachers vacancies. Interested and eligible job aspirants are requested to appear walk in on 29th and 30th May 2018. Check out further more details below. About School: Our Indian 3C School aims at making every student a thinking citizen who is completely aware of inner self by breaking the barriers created by the text book confined education. Our initiative would connect global concept of education with Indian Values.